Let's hear it for Steve Nash for MVP. Let's start the campaign right here and now. The Suns won 29 games all last year. They're going to win that many by mid-January this season. It's only December, but groundswelling and grassrootsing take time. On a thing like this, we have to get the ball rolling early. He isn't your typical candidate. He's averaging just about 16 points a night, and MVPs are usually good for well above 20. He's playing the pure, pass-first point, and you can ask John Stockton and J-Kidd how much hardware that's been good for over the years. (Magic didn't win an MVP until he bumped his scoring to 23-plus in '87). He's a long shot, but he's the right call. The Suns score 109 points a night these days (14 above the league average, seven better than their closest competitors). They run good teams into the ground. They come in waves, they go on 21-0 runs (against Golden State last week) that turn NBA games into spirit-crushing, basketball-bully scenes straight out of "The Great Santini." His numbers aren't the gaudiest -- but he still deserves some hardware. He's as fast from circle to circle as anyone in the league, and he's pushing the ball up the floor like he's got the hounds of hell at his back. He averages 11 assists a night, and 15-plus per 48 minutes. He hits guys filling lanes and guys spotting up; and when the defense sags, he calls on his own junebugging jumper to the tune of a .533 field-goal percentage (and .414 from 3). Look at those last two numbers. Think on them a minute. Tape 'em to your set for Wednesday night's game against the Jazz; and while you watch, try to reconcile them with the speed and aggressiveness of his approach. (You might need that TiVo slo-mo feature.) They do not compute. But there they are. The game is flowing off his fingers. He's crackling. Think Mickey the Magician at the heart of the "Fantasia" storm. Think of popcorn going bang under the Jiffy-Pop foil. Ask Amare, who's up six in-perfect-stride points a night over last season, what I'm talking about. Ask Shawn Marion, if you can get him to come down off his alley-oop cloud. Ask Joe Johnson about his career bests from the field and from beyond the arc. Ask the good people over at 82games.com, who'll tell you the Suns, with the addition of Nash at the helm, are thus far 69 points better than the next-best five-man unit in the league (San Antonio's starting five). Ask the fans in Phoenix, many of whom, rumor has it, are growing their hair out and wetting it down on game days in the hope that some of the Nash magic might wind its way into their lives. Because, see, Nash's first pass, the selfless, quick-draw way he's kicking the ball to open space and to open teammates, is infectious. Look at highlights from the beat-down the Suns put on Orlando Monday night. 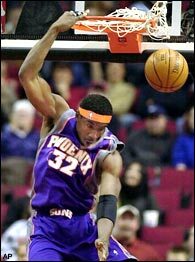 Quentin Richardson's rising up for what looks like a Quentin Richardson jump shot on the right wing, but he's just duping ... in mid-air, the shot becomes a little dump-down to Stoudamire, which becomes a big ol' dunk, which becomes five smiles on the way back down the court. 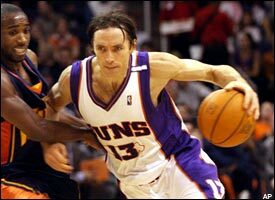 I'm telling you, Steve Nash isn't a Sun, he's the culture of the Suns (as a team, Phoenix is averaging a fourth-best 23.09 assists per game). He's who they are. And what they are is 18-3. Amare Stoudemire's got to love getting dunks off Nash's dishes. I'm telling you, Steve Nash for MVP. He's worthy. He's worthy on his own merits; and he's worthy because his energy, style, and skill have done a remake on the Suns that puts the surgeons and stylists at "The Swan" to shame. And just think of the way the vote strikes a symbolic blow. Here's a guy who turns the MVP tradition inside out. Here's maybe the least predictable winner in history. You don't have to be a dominant big man to win. You don't have to lead the league in scoring to win. You don't have to dunk to win. You don't have to be KG, Shaq, Kobe, or T-Mac. You can be a wiry, hang-dog, thirty-something, 6-foot-3 point and be the center of the basketball world. A vote for Nash is a vote for the points of old, too. It's a vote for Cousy. It's a vote for Kevin Porter and Tiny Archibald. It's a vote for Isiah and Stockton, and for Kidd, as well. Call Steve Nash the MVP and you recognize a whole team. You acknowledge all the players who flow with his flow, from Amare to Bo Outlaw, and every Casey Jacobsen in between. More than that, call Steve Nash the MVP and you recognize the whole idea of team. The Suns have five guys averaging more than 14 points a game right now. There are stars on this team, to be sure, but there's no traditional superstar. They are balanced, and a threat from every corner and angle. If Steve Nash is the MVP, basketball is fun again. Pat Riley is dead and Jeff Van Gundy is on life support. If Steve Nash is the MVP, we're not about wars of attrition, muscle-bound match-ups, and watch-the-paint-dry isolations. We're about pace, about play, about players, and about the game we know and love from the schoolyards and those grainy Showtime games on NBA TV. Steve Nash has simply transformed the Suns in his first season in Phoenix. It's a statement vote. It's a style vote. It's a philosophical vote. Steve Nash for MVP! Steve Nash for MVP! Steve Nash for MVP! Make it a movement. Make it a shibboleth, one of those code phrases by which believers of the same faith recognize one another and gather together. And let the word go forth. Paint a sign on a wall somewhere. Write it in the dust on somebody's back windshield. Get a tattoo. Put it on your answering machine. Eric Neel is a columnist for Page 2. His Basketball Jones column will appear each Wednesday during the NBA season.